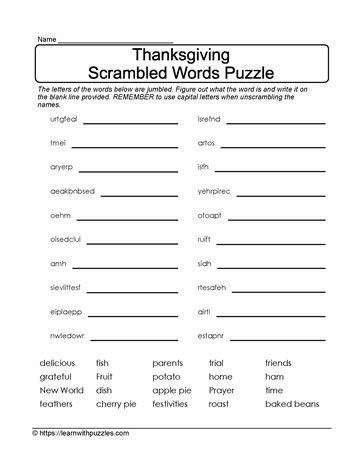 More scrambled Thanksgiving theme based words to decode in this printable puzzle. Ignite students' problem solving skills with this downloadable puzzle. Letter pattern recognition, letter sequencing and memory skills about the words they are looking for, will all contribute to growth in students' vocabulary, development of neural connections and confidence as a learner. Remember to differentiate instruction and continue to extend learning, resulting in improved student engagement with these downloadable, free printable puzzles.